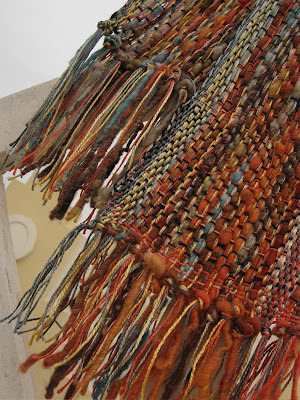 "Not every piece is a Masterpiece. 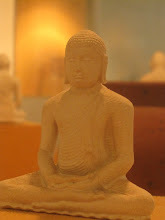 But a masterpiece will not just show up, full blown, the first, second or even third time you do something. 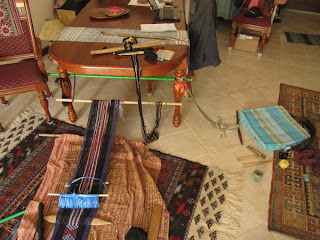 It takes work. 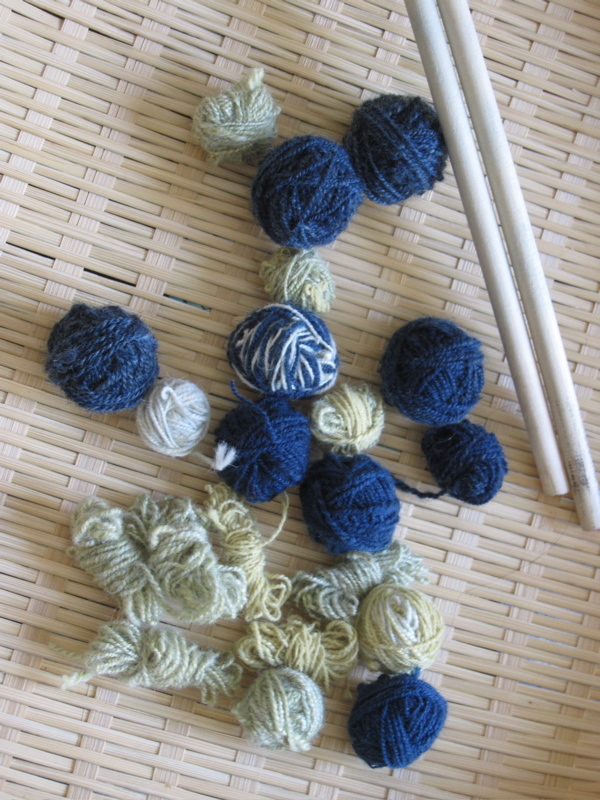 It takes a body of work, with incremental learning along the way. 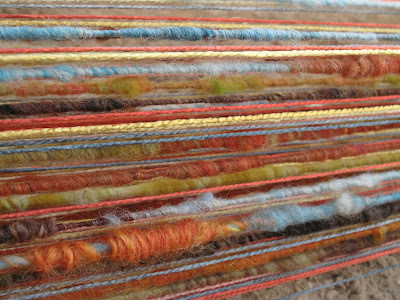 It takes a visceral and physical understanding of the materials and process in which you choose to work; it requires you to put in the time. 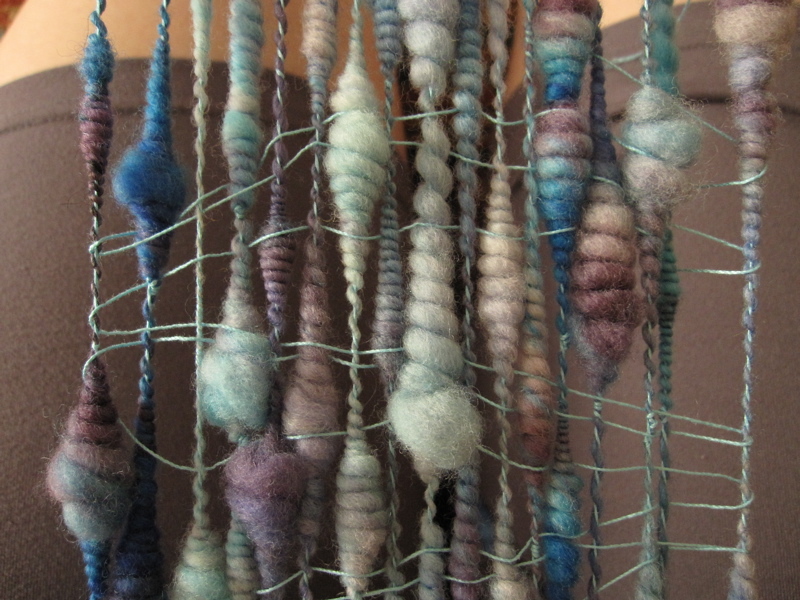 The subtle body knowledge that comes from working on your craft has nothing to do with what’s in your head; it’s a muscle memory, and an unconscious knowing without thinking, an integral part of who you are." 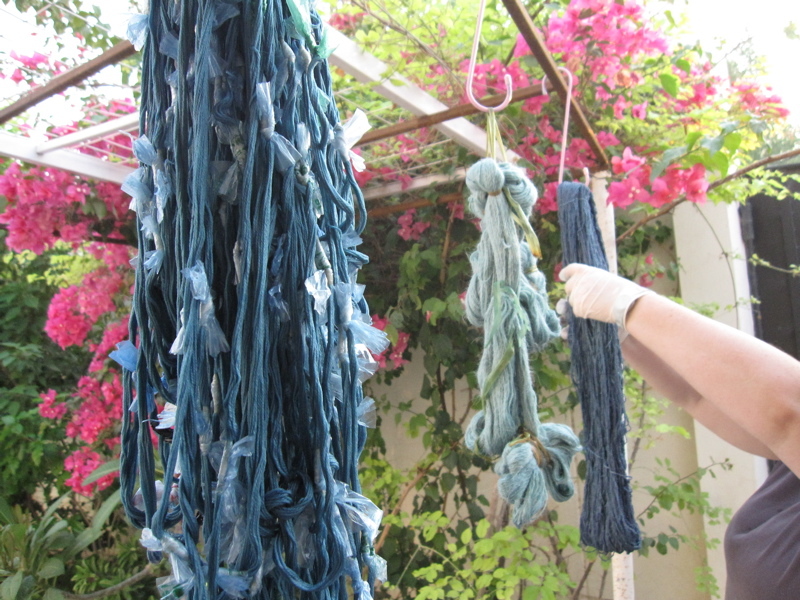 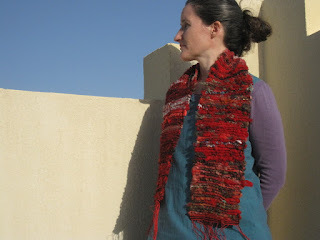 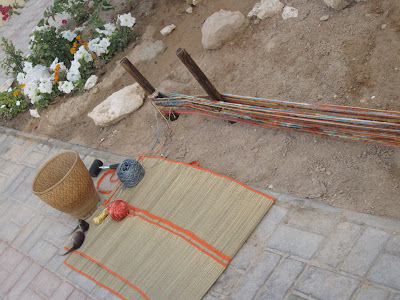 - Sara Lamb, "The Cult of Perfection"
When I heard that a friend here in Doha was going to try out an indigo dye kit, I decided that was my chance to attempt ikat. 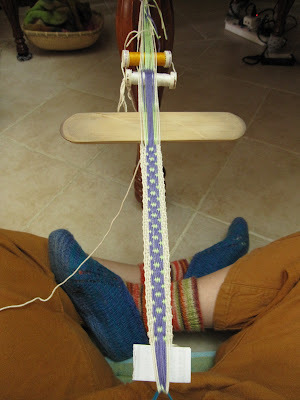 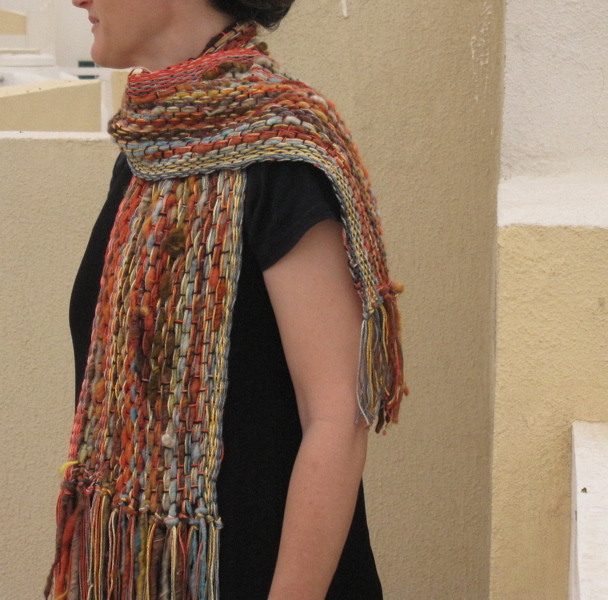 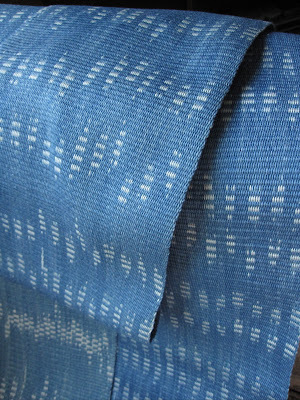 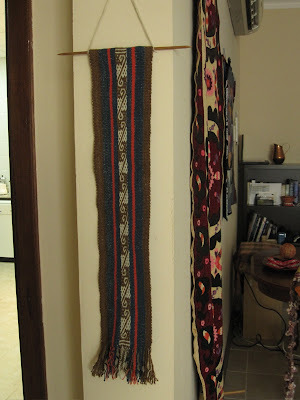 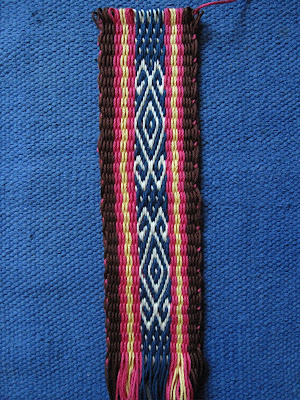 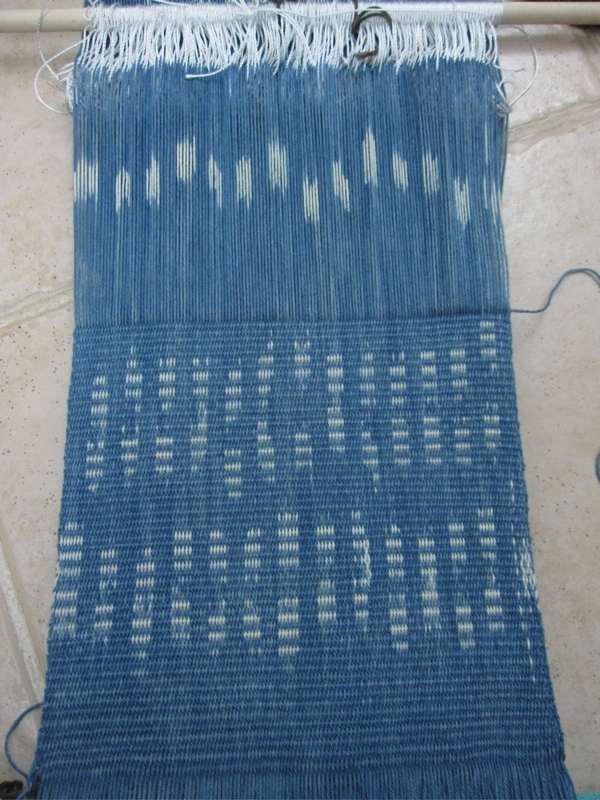 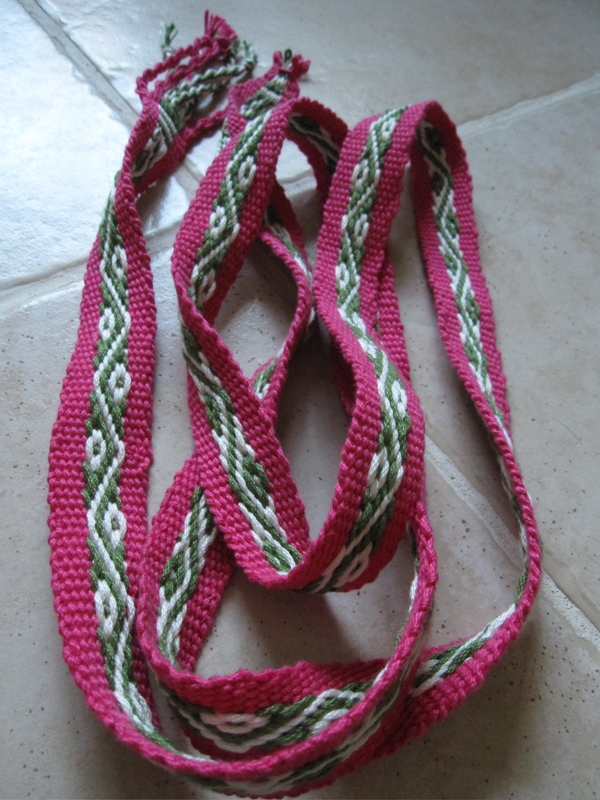 Or I should say planned-out ikat, since I had dyed an ikat warp once before in Judith MacKenzie’s workshop. 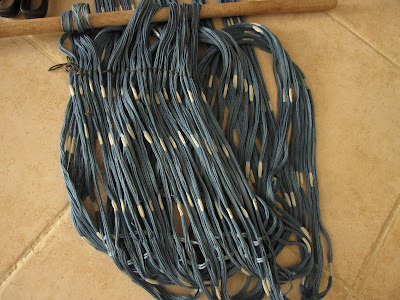 The warp in Judith’s class was tied and dyed multiple times, in a very haphazard fashion, since I was trying to fit it in between the preparation of another 230-end warp for woven shibori. 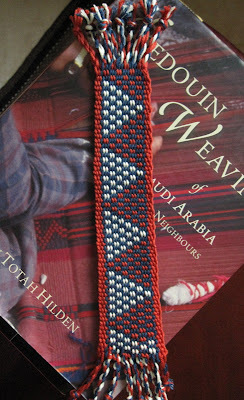 It turned out very nicely, but I can’t say there was much design behind it. This time, I wanted to tie deliberately, with some sense of order, and since it would only be blue and white, I could hope to get a simple pattern with a simple set of ties. 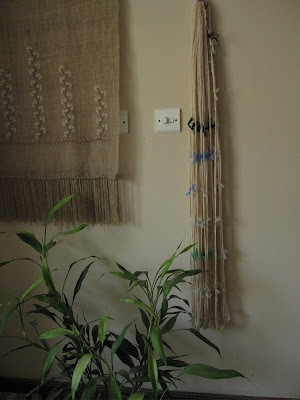 I made a warp with undyed cotton yarn I’d purchased in Syria last February, stretched it between two chairs in my kitchen where the light is good, and divided the warp threads into bundles of ten. 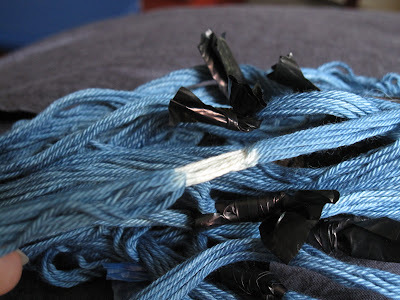 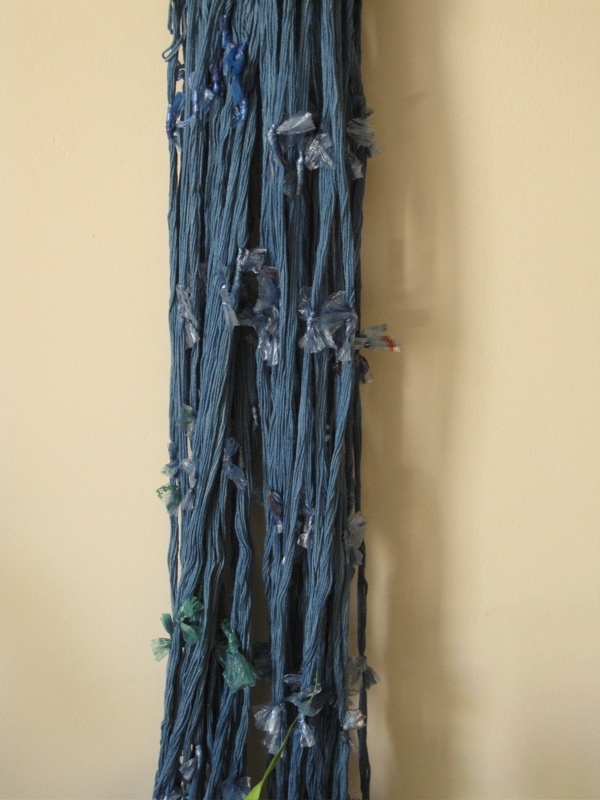 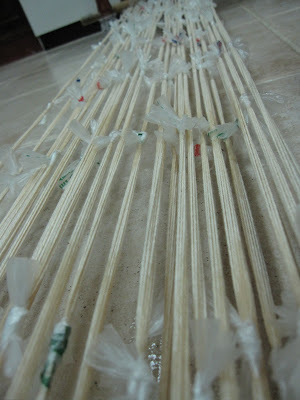 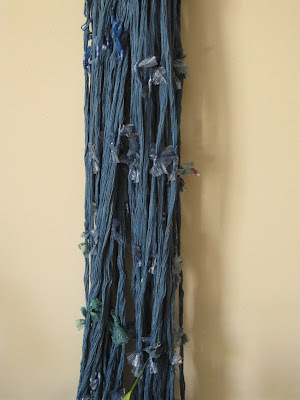 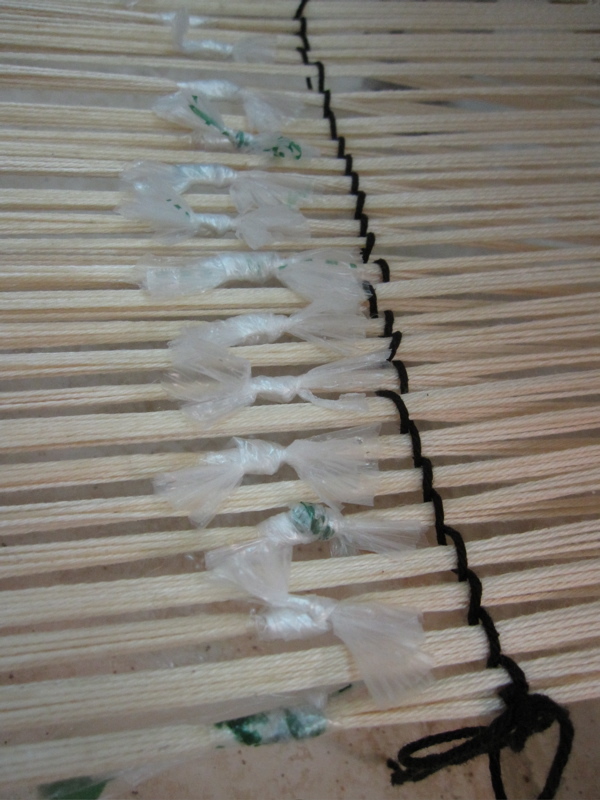 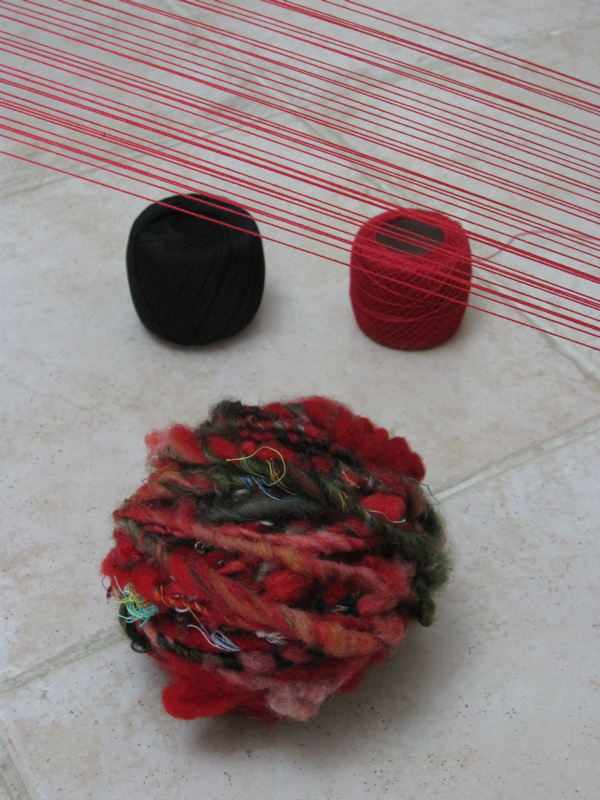 Using strips of plastic from grocery bags, I wrapped tightly around alternate bundles across the warp, wrapping three times and tying a knot, covering about ¾” with each tie. 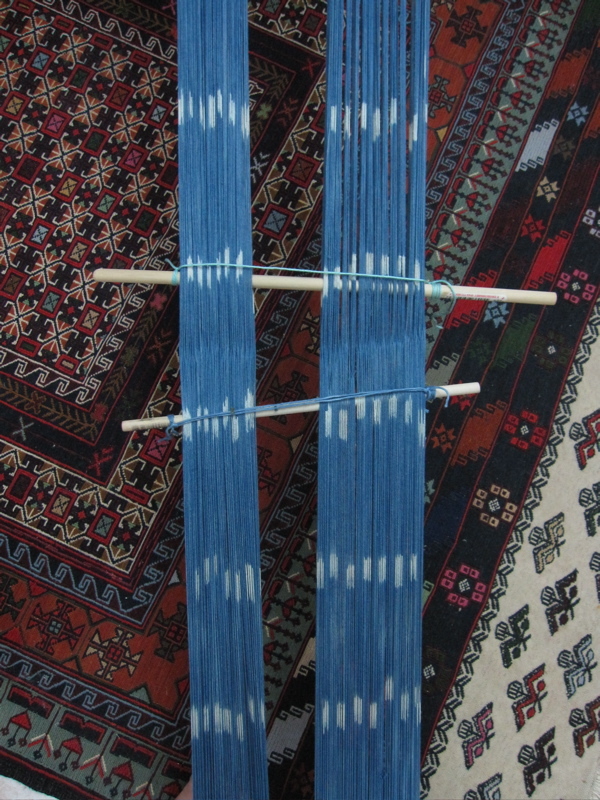 Then a few inches along the warp, I’d tie the alternate groups of ten that were not tied before. 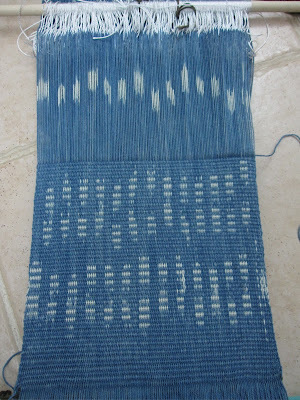 This way my resist marks would be staggered – if they were up next to each other, they’d form a check pattern. 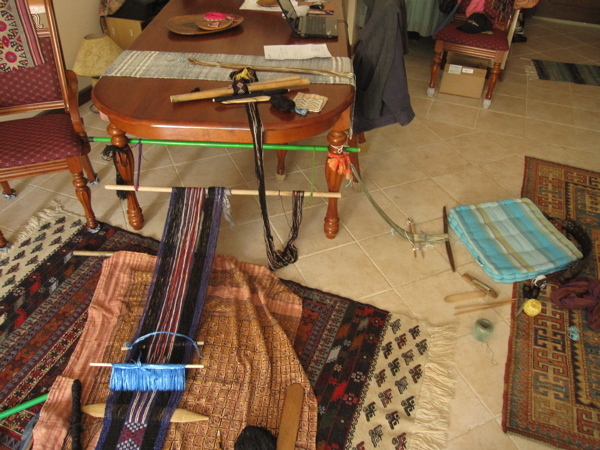 Sitting on the floor, wetting the warps with a spray bottle and tying was grueling due to the hunched posture required, and it took me chunks of two different days to complete the tying of my 247-end, 90-inch long warp. In the meantime, I watched a documentary film made by Virginia Davis and Hillary Steel about the master Mexican weaver Don Evaristo of the Teluca Valley, who weaves cotton ikat (or jaspe) rebozo with 100 ends per inch, dyeing intricate resisted patterns which are alternated with plain warp. 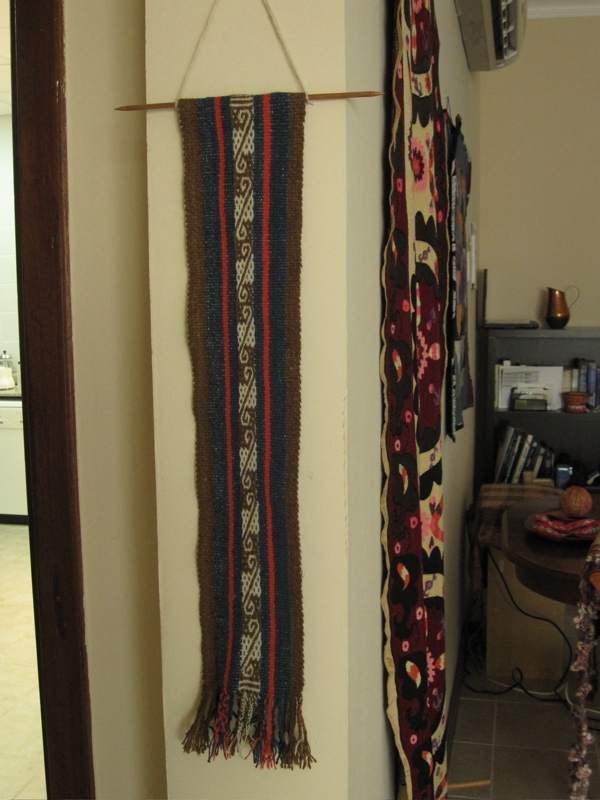 His work made me feel like a pre-schooler drawing with huge, oversized crayons, but one has to start somewhere. 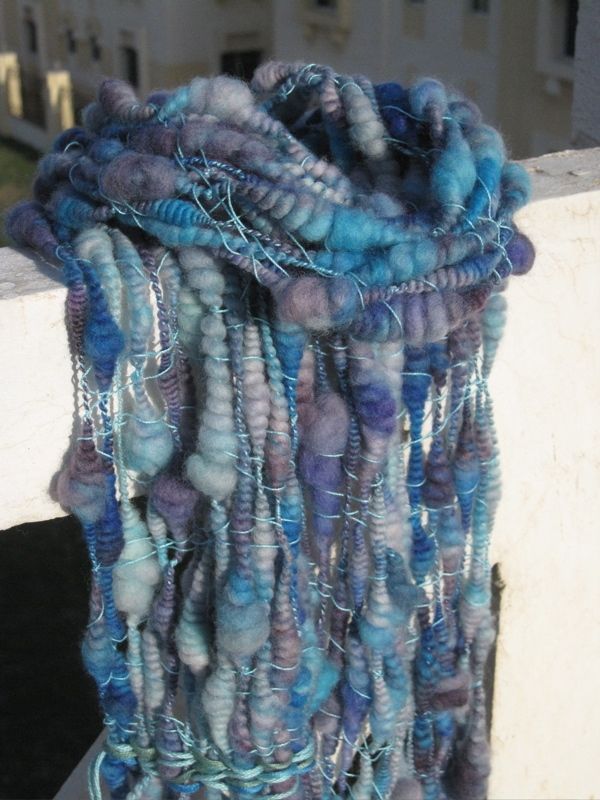 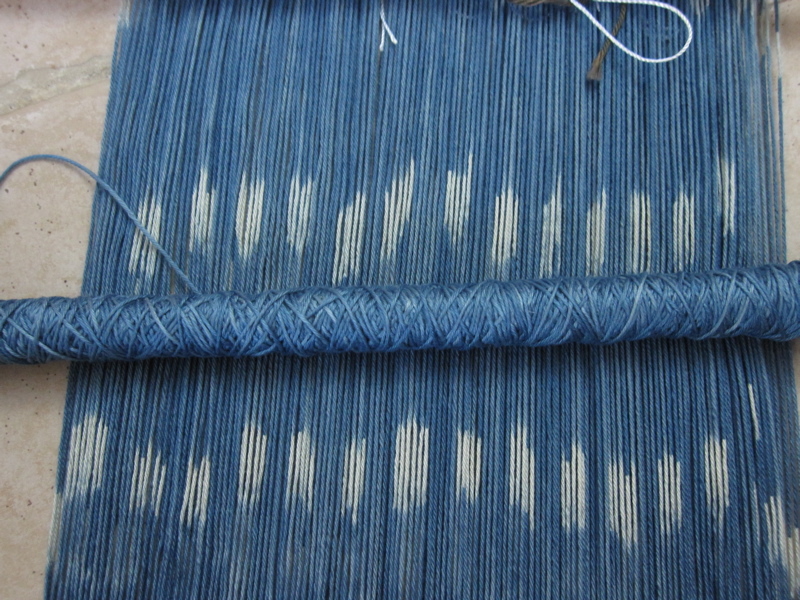 Our indigo vat was rather weak, but I prioritized the warp yarn and kept dipping, and dipping, slowly increasing the depth of color to a shade that looked like faded denim. 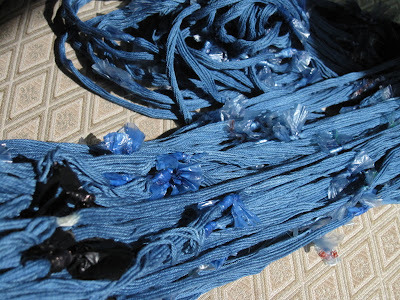 I also dyed an untied skein of cotton to use for weft. 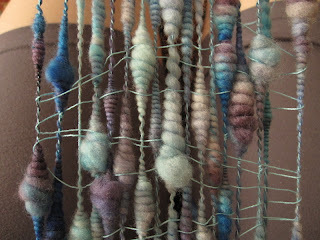 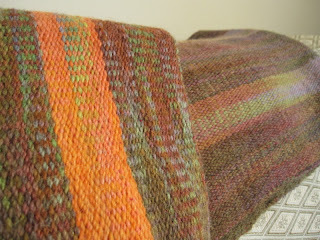 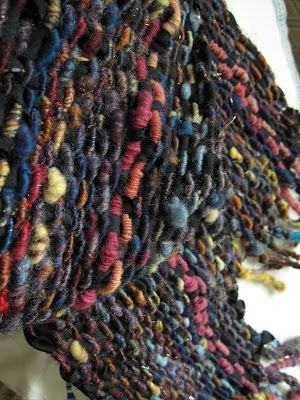 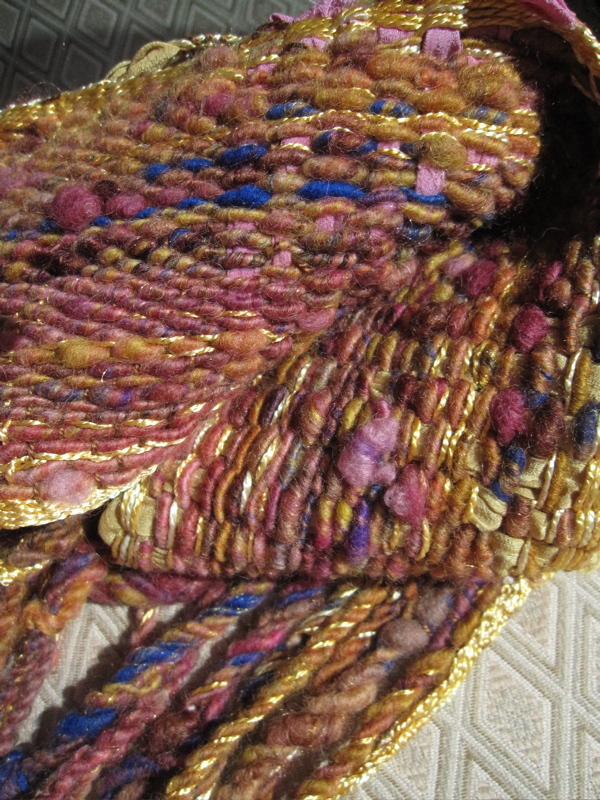 Both skeins ended up with a very irregular penetration of color, but this semi-solid effect adds a sort of texture. 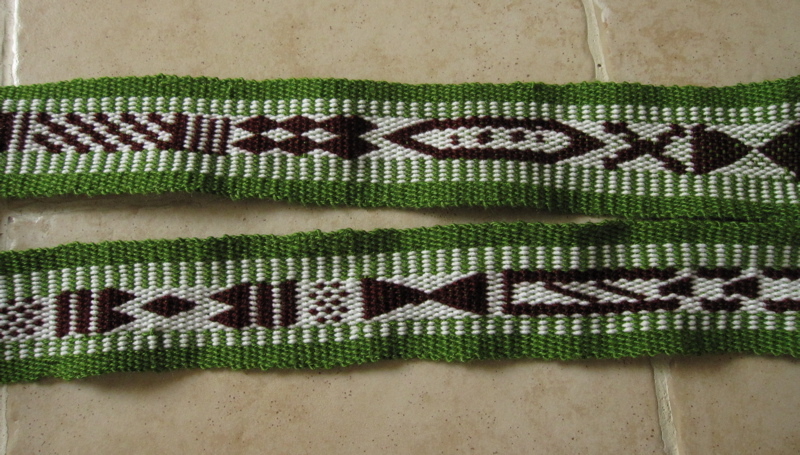 Just getting the color dark enough to contrast the resists well was my goal. I’ve admired ikat weaving ever since I worked in an import store in Kansas City and got exposed to textiles from all over the world. 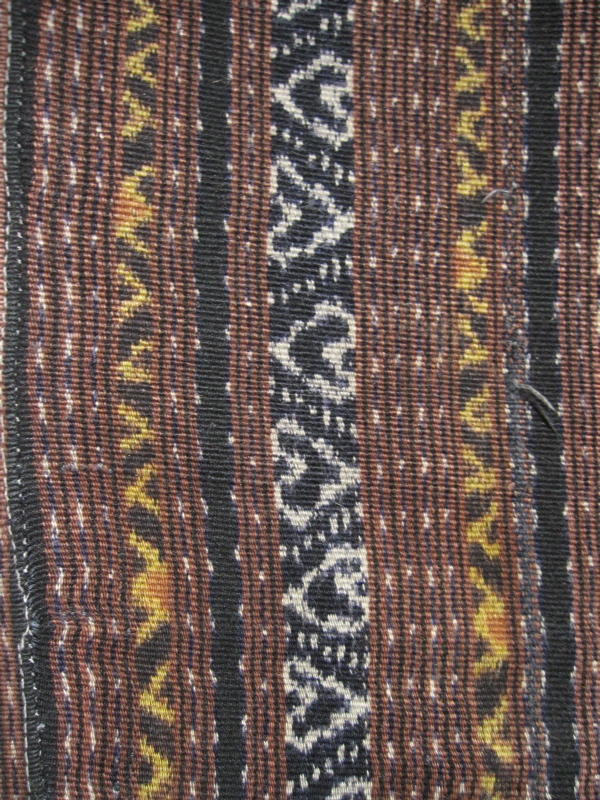 The Indonesian ikat weavings completely baffled me when I contemplated the amount of precision and complexity of skills required to execute such a design. 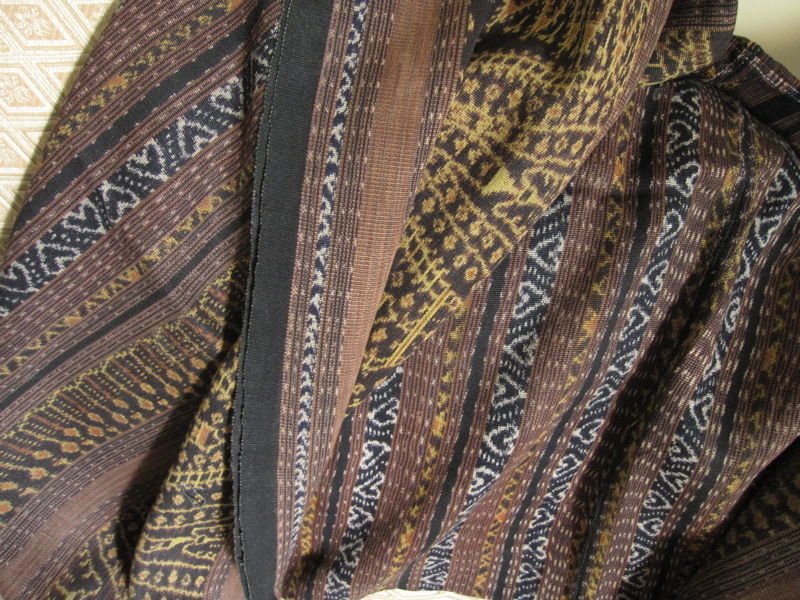 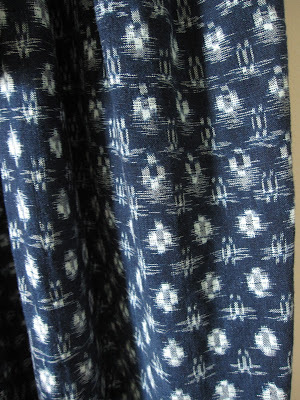 Ever since I bought this sarong from Flores, back in 1990 or so, I’ve dreamed of backstrap weaving and ikat. 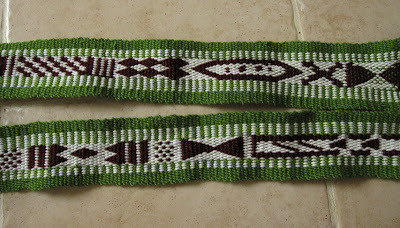 The Flores designs are my favorite because they’re delicate, small-scaled and repetitive. 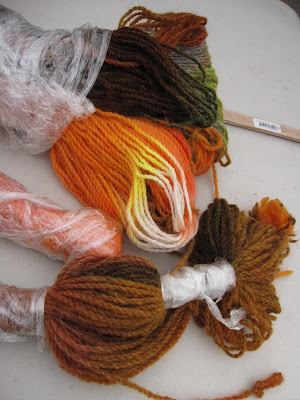 I also like their palette of brown, ochre, russet and a touch of black. 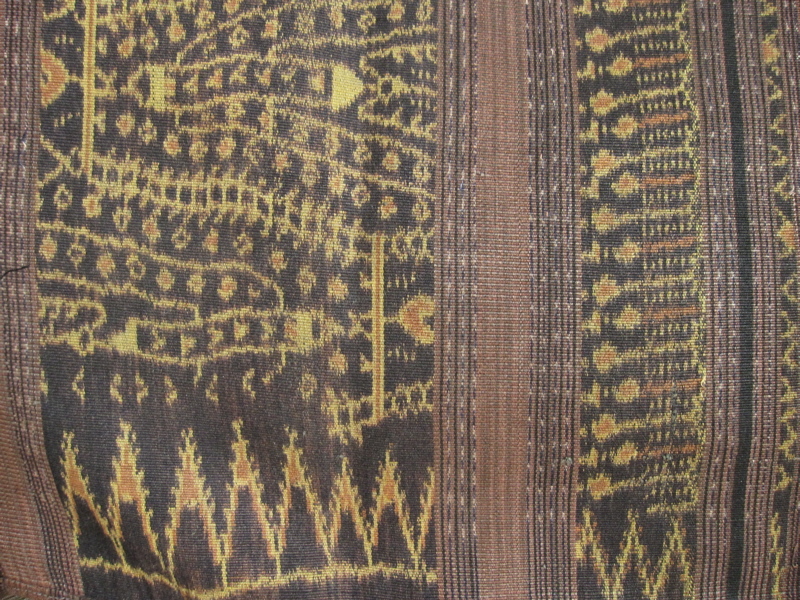 Now that I’m a weaver and can examine this more knowledgeably, I see that it’s made of four panels, each with selvedges on both sides – probably two panels were woven, the one with the border design and the one without, and these were each cut in half to sew into the sarong shape (the vertical seam is a French seam, hiding the edges.) 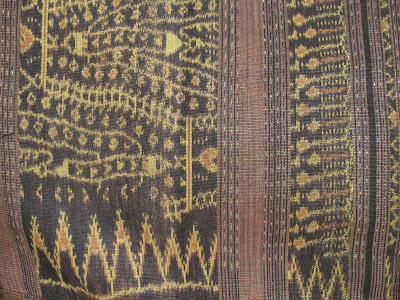 It’s a warp-faced weave, and the ikat design is in the warp only. 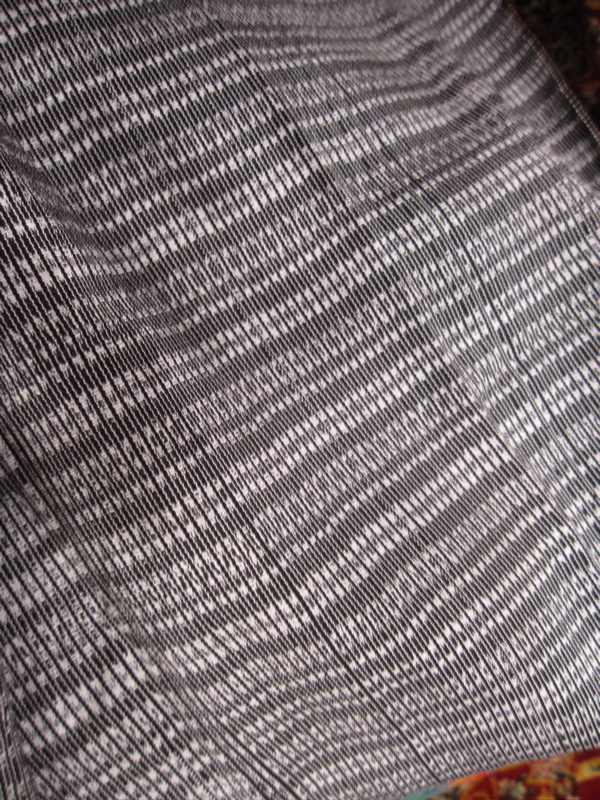 It’s cotton, but I’m not sure if it’s 100% cotton because there’s a shine to the surface. My fiber-identifying skills need some work. The other concrete inspiration I have with me is my kasuri robe, purchased by my husband in Japan in about 1998. 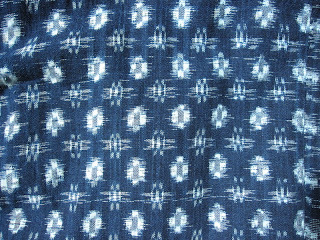 This pure cotton, indigo-dyed double-ikat was the fabric of the peasantry in previous centuries, which always gives me pause: really?? 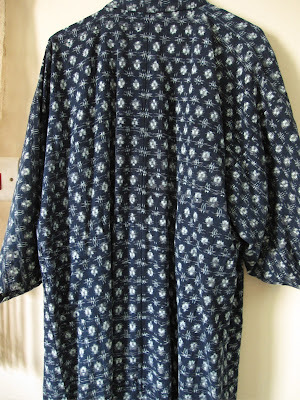 This is what the poor people wore?? 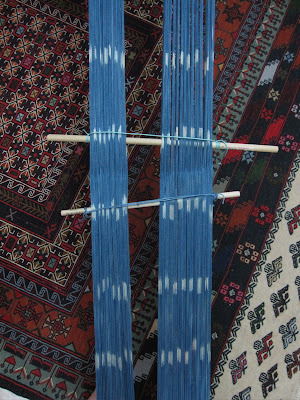 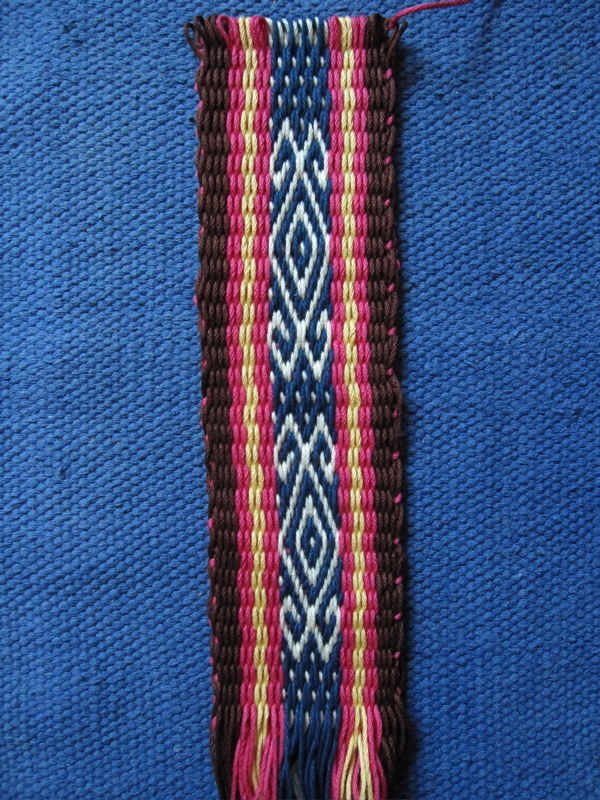 It’s “double-ikat” because both warp and weft are resist-dyed to create the pattern, and both need to be properly lined up during weaving for the pattern to manifest. 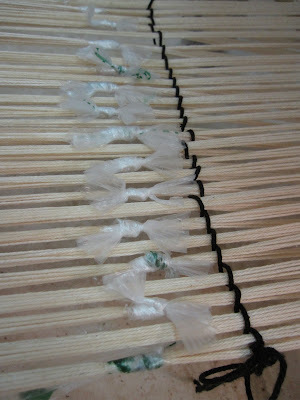 Boggle your mind? It does mine. 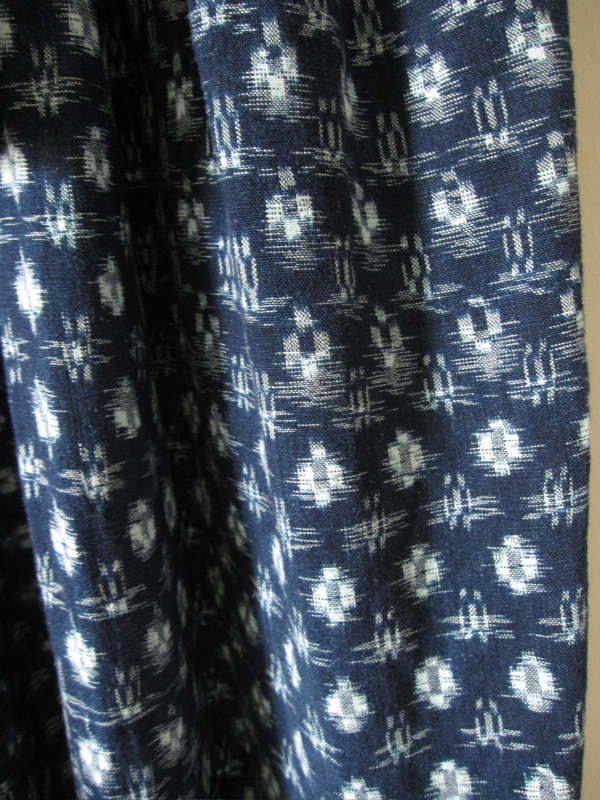 In some areas of this robe, you can see where the warp and weft got jogged apart, and the pattern disperses. As with the sarong, the kimono is woven in long strips and then assembled into a garment. 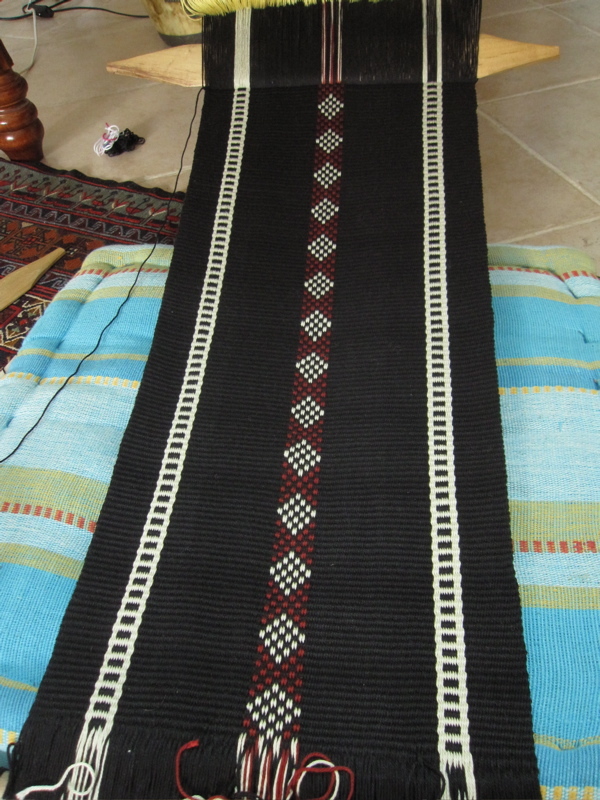 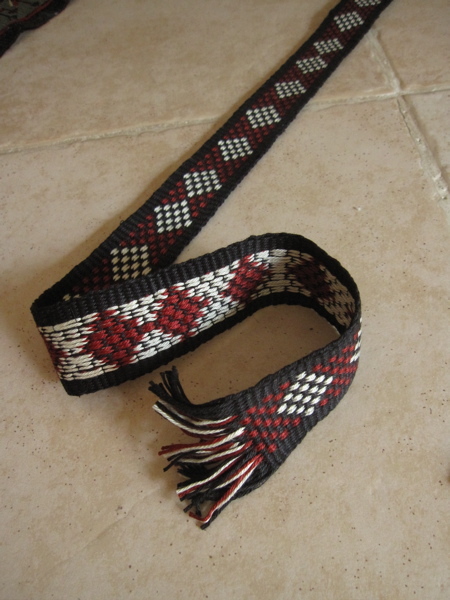 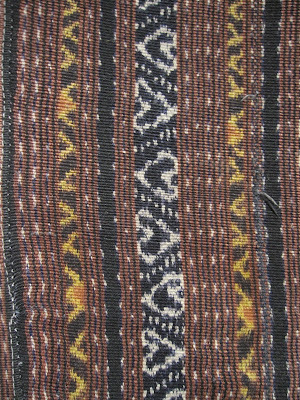 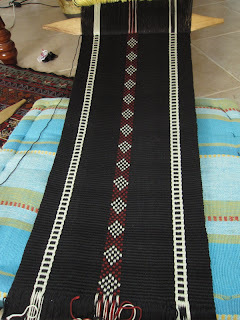 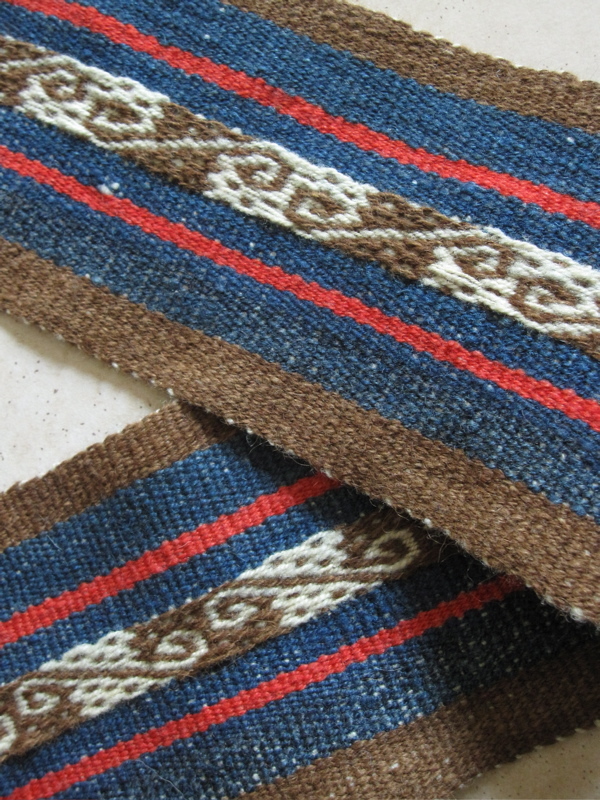 The kasuri is balanced plainweave, though, not warp-faced, and was probably woven on a frame loom. 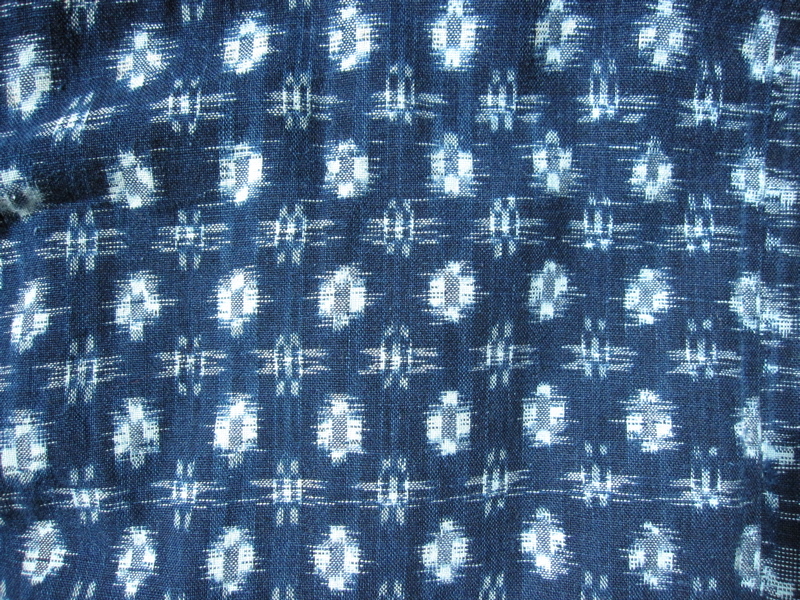 Double ikat also appears in India, where the craft has been developed and traditionally sustained by two communities, one in Gujarat and one in Orissa. 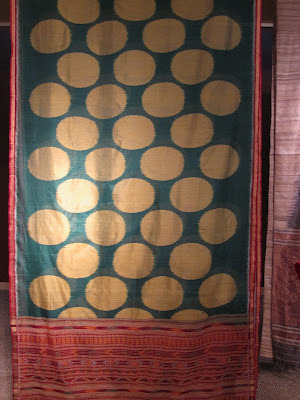 I saw some stunning examples at an exhibit during the Textile Society Symposium (2010) in Lincoln, Nebraska. 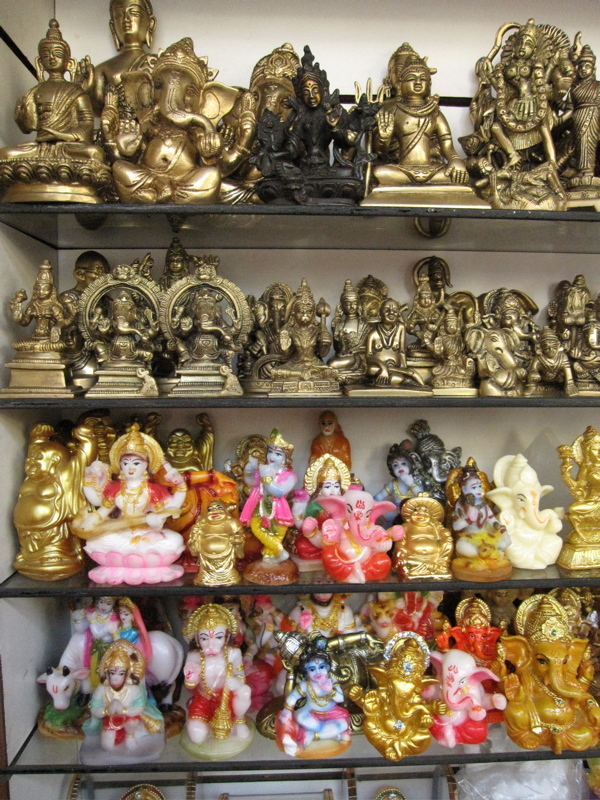 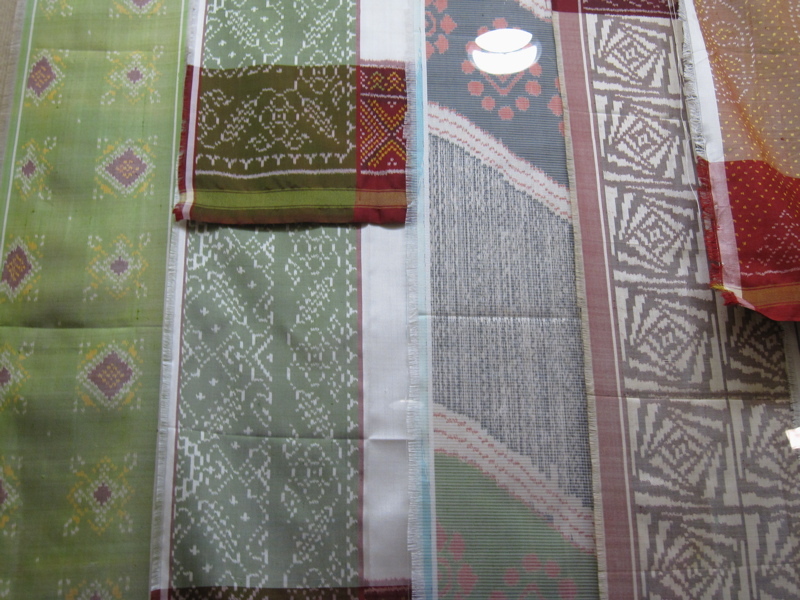 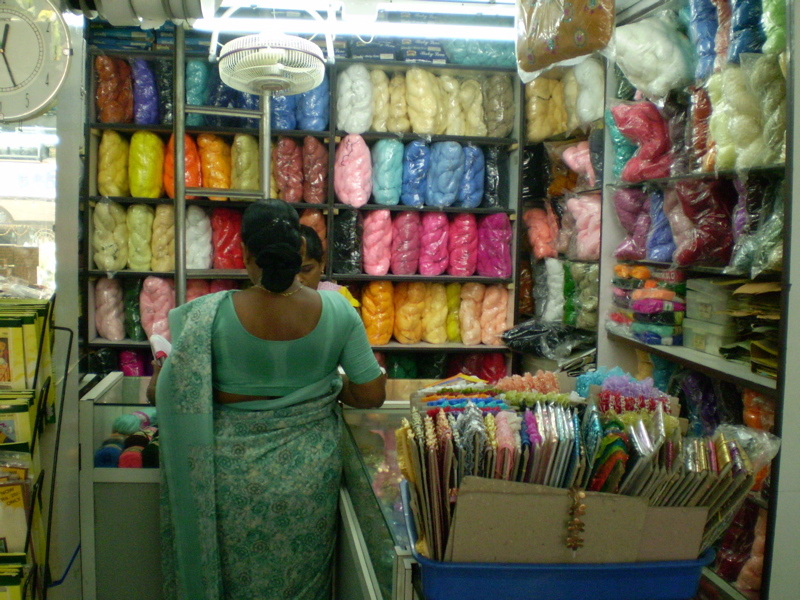 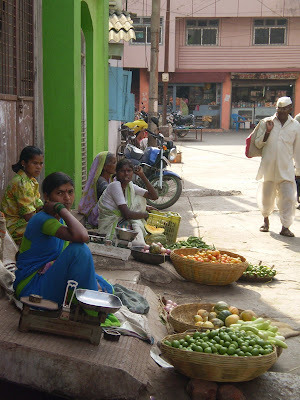 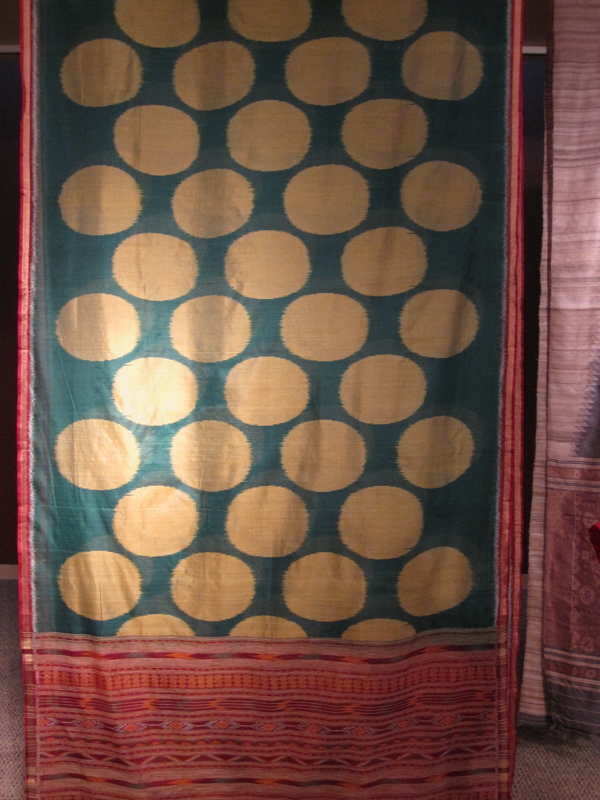 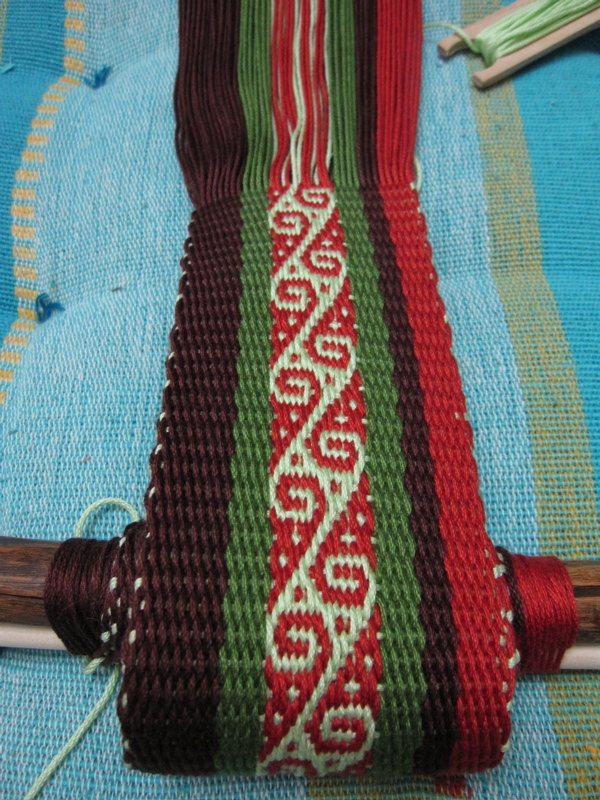 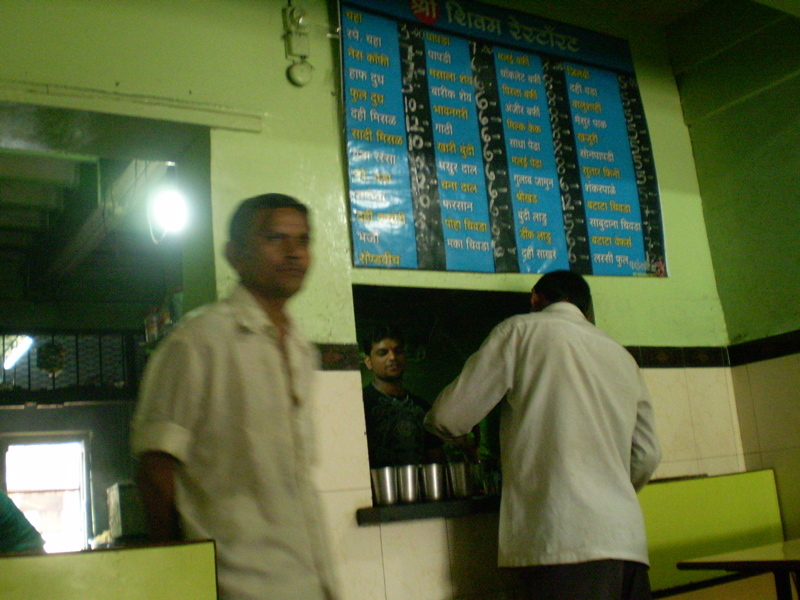 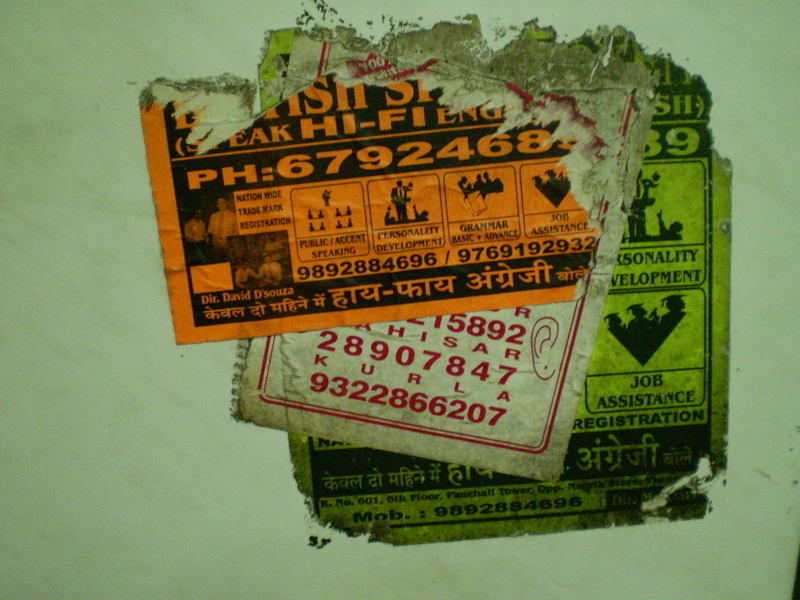 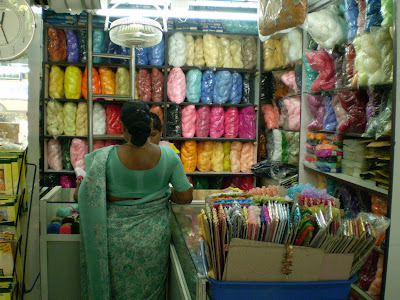 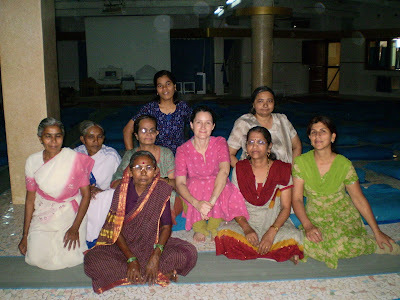 This technique, known as patola or bandha, usually appears on saris woven with silk or fine cotton. 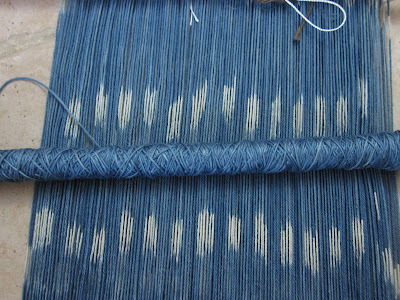 Returning to my humble attempt, I was quite happy with the precision of the resist my ties created, but as you can see (bottom photo,) the resisted threads got staggered away from their bundle-mates in the process of setting up the warp for weaving. 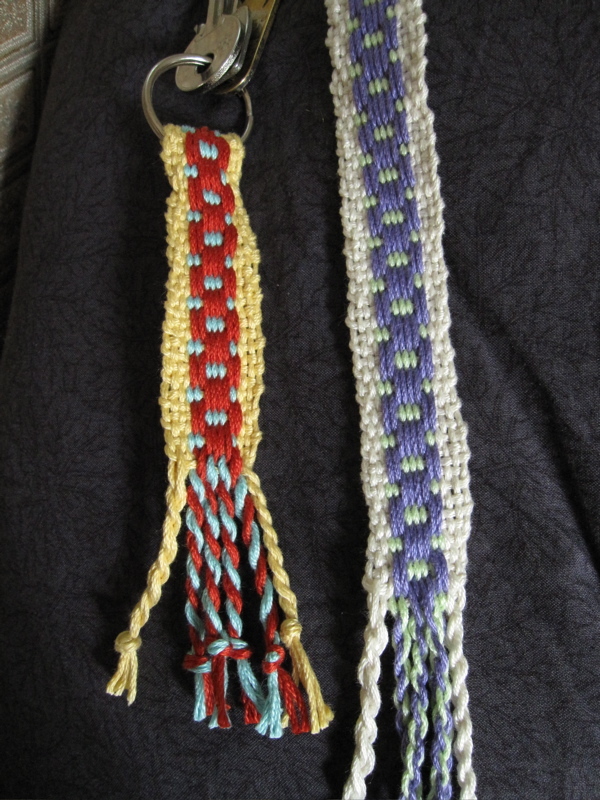 I could have adjusted them and tied them into position, but instead I just started weaving, interested to see what it would look like. 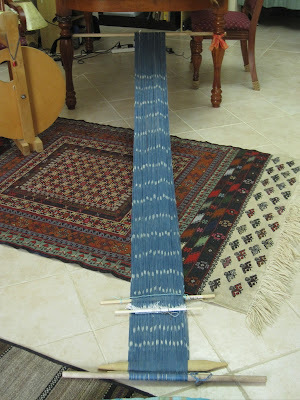 When I begin to weave something like this, I am overwhelmed by the fact of it – I can’t quite believe that I’m making fabric in the same way people the world over have made fabric, tying up to something stable and tensioning the warp with the body. 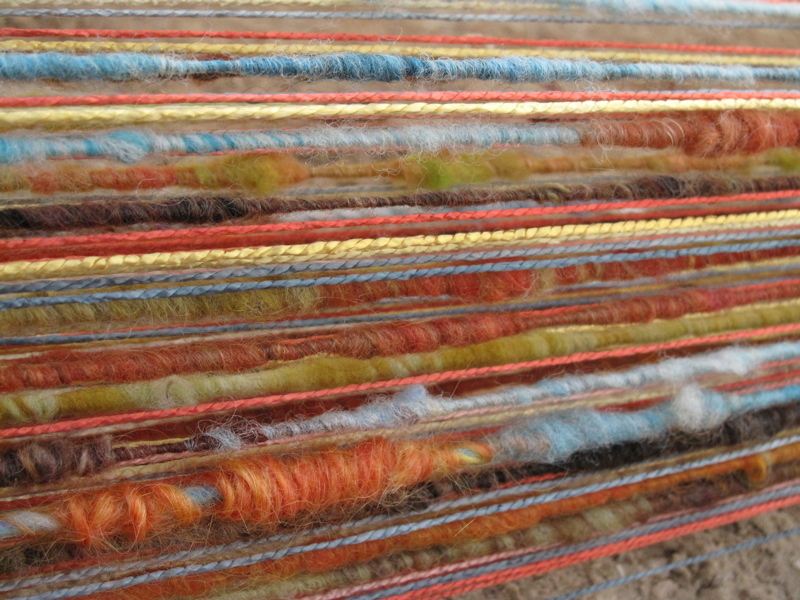 It’s similar to the feeling of spinning with a spindle, back in the beginning when I was awed by the ancientness (awkward word, but spellcheck does not dispute it) of the act. 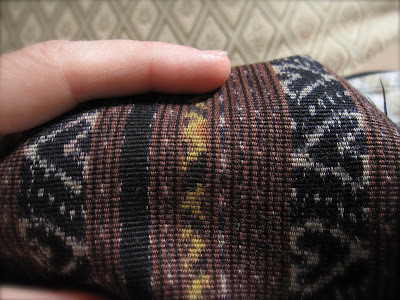 I can’t describe it, but there’s a sense of space and time expanding below and above and all around, erasing the gaps between me and anyone else who has ever done this. 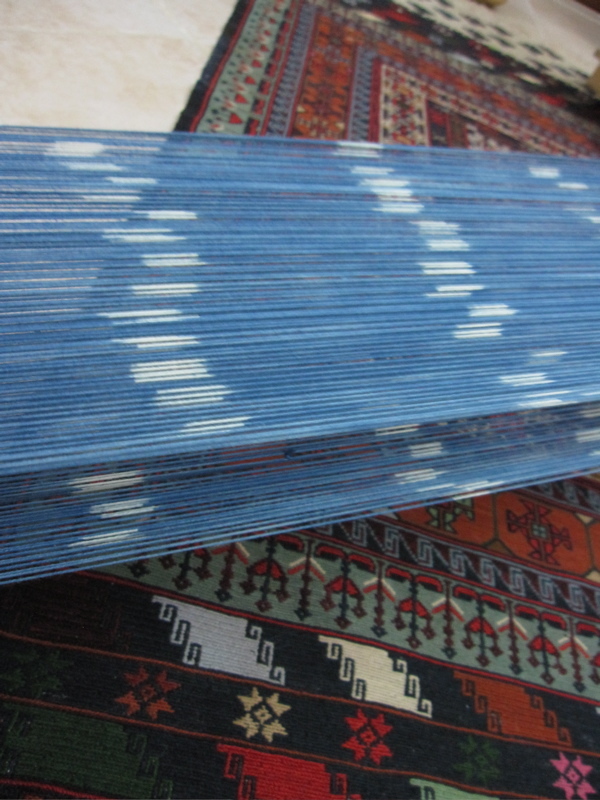 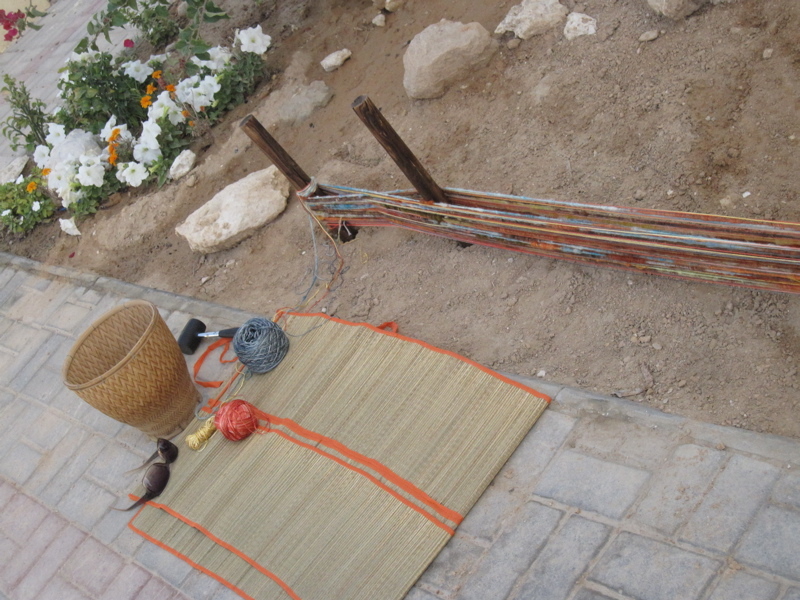 So I carry on, weaving my staggered ikat marks, which spell out a strange rhythm of hieroglyphs. 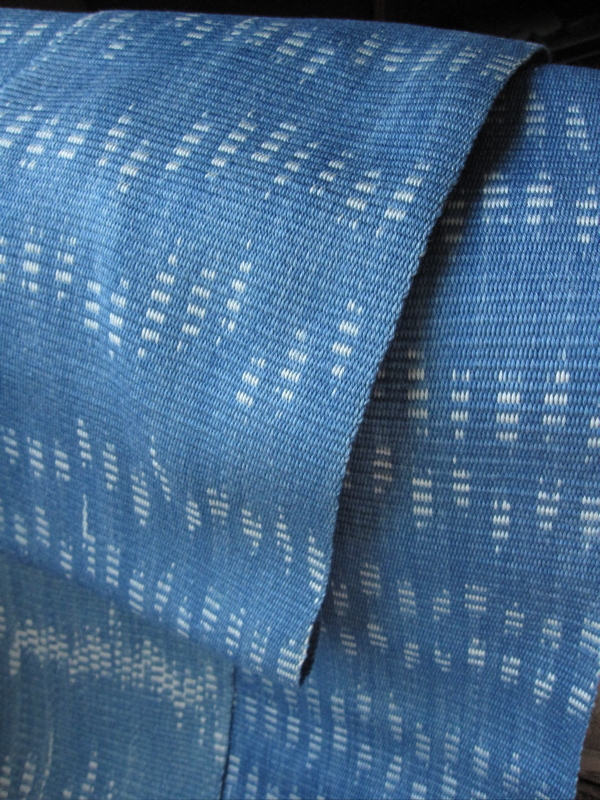 I embrace their unhinged pattern the way I embrace the serendipitous designs of resist-dye on fabric, which often carry the imprints of water, the sublime irregularities of nature. 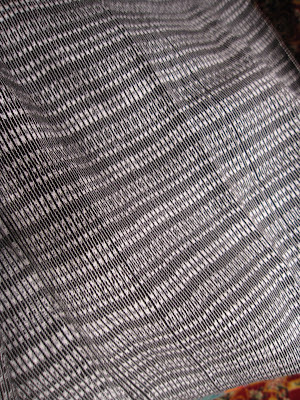 Giving voice to the unpredictable is one of the joys of creation, and I save any urge to “correct” the design for another time. This is my first piece, my learning piece, and it will have its own language.